A large, low-flying plane sparked concern for many downtown workers in Nashville. Turns out, it was part of a pre-scheduled dry run for a flyover. 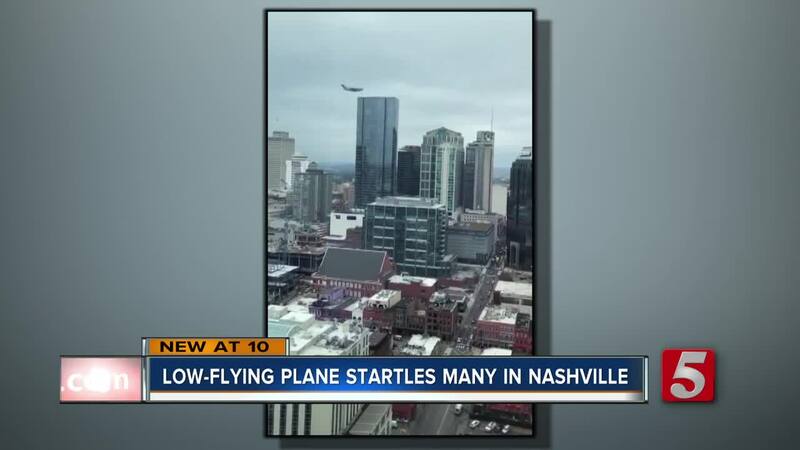 NASHVILLE, Tenn. (WTVF) — A large, low-flying plane sparked concern for many downtown workers in Nashville. Turns out, it was part of a training exercise for Saturday's inauguration. People working in downtown Nashville reported seeing the plane flying just above buildings just before 2 p.m. Friday. Some even evacuated their office buildings out of fear. "It was flying directly at the Batman building, and from our view, it looked like it was going to clip the top of it," said Mallory Riggins, who witnessed the plane from her office building in downtown Nashville. Riggins captured video of the plane's second loop through downtown. "It's terrifying to say this," said Riggins, "9/11 was the first thing that went through my head." Janice Skelly and her family saw the plane fly over Centennial Park. They were visiting from Raleigh for a hockey tournament, and went to Centennial Park to see the Parthenon. Skelly said the plane flew over the building, and she was able to capture video on her cell phone. "It was a little scary," said Skelly. "It was a big shock to us and everyone else at the park." Governor-elect Bill Lee’s camp confirmed the flight was part of a pre-scheduled flyover for Saturday's inauguration – but that flyover has since been canceled since the event was moved indoors due to the weather. However, the Tennessee Department of Military went ahead with the training session. The plane is a U.S. Air Force C-17A Globemaster III from 164th Airlift Wing in Memphis. Some witnesses said they believed they should have received some advance notice of the flight. They believed that would have helped put people at ease. "With no notice, it just leaves us to assume," said Riggins. "In today’s age you assume the worst." The Tennessee Department did not comment on why no notification of the flight was offered.